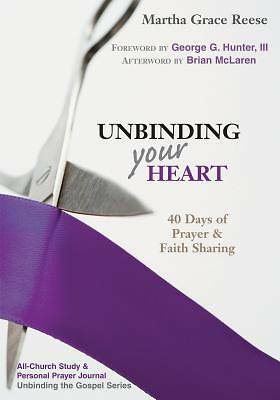 Unbinding Your Heart: 40 Days of Prayer & Faith Sharing is a brilliant book -- witty, engaging, and grounded in a four-year Lilly Endowment study. Unbinding Your Heart is a six-week individual and small-group study for your entire congregation. [It is the culmination of the Real Life Evangelism Series, by author, researcher, pastor and attorney Martha Grace Reese. Church leaders should first study Unbinding the Gospel (the church leaders' study) that was selected by The Christian Century as a featured "Take and Read" book in its 2007 Book Issue. Then use Unbinding Your Heart as a study and devotional for the whole congregation. The third book in the series, Unbinding Your Church (the pastor's guide), will help you plan, teach, pray and organize your all-church study. The Real Life Evangelism Series has been enthusiastically endorsed by eight heads of denominations, Brian McLaren, George Hunter, Becky Garrison, Todd Hunter, Richard Peace, and countless pastors and church leaders. Important Note: Order a copy of Unbinding Your Heart for each person participating in the study. There is an individual prayer journal included to be used by each participant.